Trying to pin down the precise features of the next iPhone has been difficult of late. We’re all expecting a standard “S” model iPhone 7 and & 7 Plus that won’t be radically different from last year’s, but we’re also expecting a high-end model. 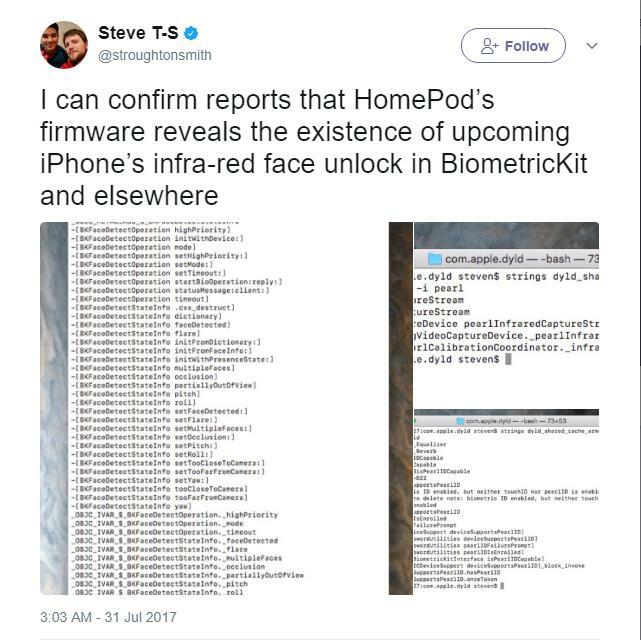 It appears, based on a tweet from developer Steve Troughton-Smith, that at least one of those models will have face unlock. And the high-end model (alternately referred to as the “iPhone Pro,” “iPhone 8,” or even “iPhone X”) will have a bezel-less screen that wraps around the speaker and cameras at the top. There are a bunch of lines of code for “BKFaceDetect” here, where the “BK” probably refers to “Biometric Kit.” Apple loves using the word “Kit” for its developer tools, you see. There’s also references to an infrared camera, which would be used to to detect your face, even in the dark. Bloomberg reported that Apple would use an infrared camera for 3D face scanning earlier this month — but we don’t know whether it will come to all of upcoming iPhones. We’ve seen similar images before, but they were photos of a paper insert that shows how to remove the SIM card tray, and thus easily faked. But this image appears right in the HomePod’s code, which makes it much more likely to be real. What we’re looking at here is a screen that very likely goes almost edge-to-edge. Interestingly, it also appears to extend to the top around the speaker and sensors that sit at the top of the iPhone. Both the face unlock and the screen that wraps around the sensor are features we’ve already seen appear on Android phones — Samsung’s Galaxy and the (as-yet-unreleased) Essential Phone, respectively. So Apple isn’t the first to implement these features. 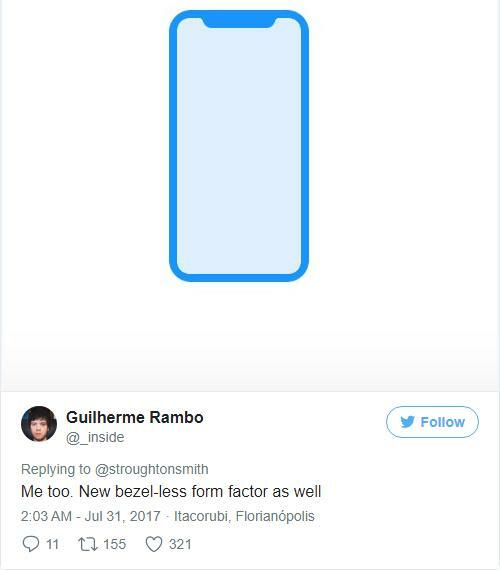 Much of the speculation and rumormongering for the next iPhone has centered around TouchID: would it appear under the screen, appear on the back of the phone, land on the power button on the side, or go away entirely. We don’t yet fully know the answer to that question, but it does look like we now know the basic look of it and that it will support unlocking by scanning your face.